Next, right-click on the NetworkManager applet to open its context menu, which is the main point of entry for interacting with NetworkManager to configure connections. Ensure that the Enable Networking box is checked. 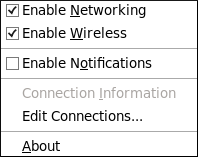 If the system has detected a wireless card, then you will also see an Enable Wireless menu option. Check the Enable Wireless check box as well. NetworkManager notifies you of network connection status changes if you check the Enable Notifications box. Clicking the Connection Information entry presents an informative Connection Information window that lists the connection type and interface, your IP address and routing details, and so on. There is an arrow head symbol to the left which can be clicked to hide and reveal entries as needed. To create a new connection, click the Add button to view the selection list, select the connection type and click the Create button. Alternatively, to edit an existing connection select the interface name from the list and click the Edit button. VPN connections, proceed to Section 10.3.4, “Establishing a VPN Connection”.